Black pepper --- 2 Tbsp. Dark brown sugar --- 2 Tbsp. Cayenne pepper --- 1/2 Tbsp. Smithfield® Pork Shoulder Roast --- 4 lbs. Garlic powder --- 1/2 Tbsp. Cayenne pepper --- 1 tsp. Garlic powder --- 1 tsp. Kosher or sea salt --- 1 Tbsp. Black pepper, freshly ground --- 1 tsp. Make a dry rub: In a small bowl, combine salt, black pepper, dark brown sugar, paprika and cayenne pepper. Sprinkle rub all over pork roast, pressing into pork. Cover with plastic and refrigerate for at least 2 hours. In a medium bowl, combine vinegar, apple juice, Worcestershire sauce and garlic powder; pour into large Dutch oven. Place pork shoulder in Dutch oven and cover tightly with aluminum foil, then lid. Roast 4 hours, or until pork is fork-tender and shreds easily, brushing roast with cooking liquid every hour. Remove from oven and let stand until cool enough to handle. Shred pork with fork or tongs into bite-size pieces; mix in TABASCO® Chipotle Pepper Sauce. In a large bowl, combine cabbage, carrots, red onions, green onions and chile pepper. In another bowl, stir together mayonnaise, Dijon mustard, vinegar, lemon juice, TABASCO® Chipotle Pepper Sauce and sugar. Pour dressing over cabbage mixture and toss gently to mix. Season with celery seed, salt and black pepper. Chill 2 hours in refrigerator before serving. In a medium saucepot, heat oil to 350ºF. In a medium bowl, whisk egg and milk. In another medium bowl, mix flour, cayenne pepper, paprika, garlic powder, salt and ground pepper. Cut onion in half and slice into 1-inch-thick half rings; separate into short straw-like pieces. Add onions to milk mixture to soak. Once oil is at temperature, remove onions from milk mixture, shake off excess and dredge 4 or 5 pieces at a time in flour mixture. Add to pot and fry until golden brown; transfer to paper towels to drain. 10. 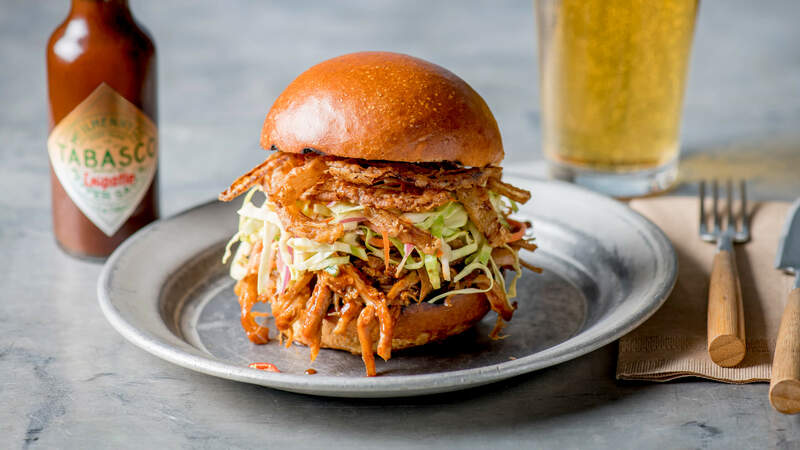 Place equal amounts of shredded BBQ Pork onto each hamburger bun, topping pork with fried Onion Straws and Coleslaw. Add more TABASCO® Chipotle Pepper Sauce as needed.